As a man growing in a house full of women in Africa (Ivory Coast) cooking or being a chef was not on the radar – it took me over 8000 miles of travel and landing here in the USA to know that this was actually my calling – it is my passion. I feel blessed, there was no better place for me to have followed my passion than in NYC which has given me exposure to a variety of cuisines. I now specialize in authentic Africa cuisine and fusion cuisine – I especially like ginger – it helps create the bridge across different palates. 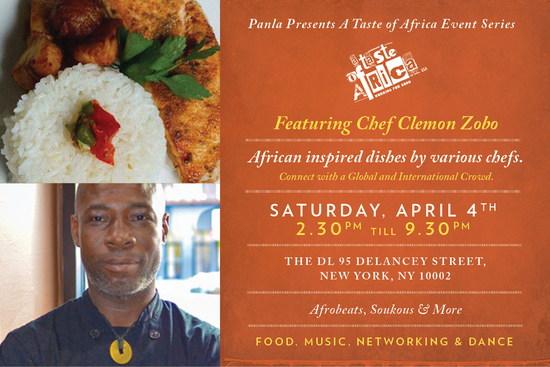 I believe the African cuisine has not been properly represented and presented – my mission is help make African cuisine one of the most appreciated in the world. I have over the years developed a unique style of cooking and an eye for cooking that brings to focus many different cuisines from French, Asian, Italian and more. Part of the proceeds of this event will benefit the ASB Foundation - http://asbaction.org/home.